Think of mulled wine as the wintry counterpart to summery sangria. Where sangria is fruity and refreshing, mulled wine is aromatic and warming — the perfect antidote to a snowy night. Mulled wine is spiced red wine, served hot. It’s a very old tradition dating back centuries to the Middle Ages in Europe. It is still common in Germany and the Scandinavian countries, where it is known as glühwein or glögi. Don’t use an expensive bottle as the base — save the good stuff and choose a value red wine, or repurpose partial bottles that have been open for a day or two. Fruity, full-bodied reds are better than delicate ones, which oxidize rapidly when heated. You should also avoid anything too tannic or pungent; those earthy, barnyard-like Rhône wines may be great with charcuterie, but they will not taste good mixed with cinnamon and served with ginger snaps. 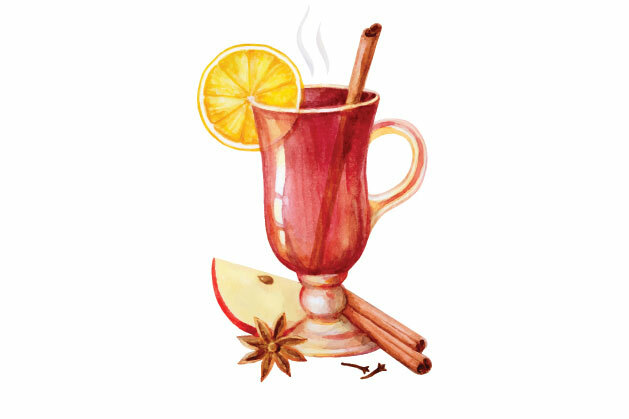 Speaking of cinnamon and ginger — those are traditional standards included in mulled wine, as are cloves, nutmeg and allspice. But you can make mulled wine with any number and ratio of spices. Experiment to find your own personal blend and consider options like cardamom, coriander, star anise or peppercorns. If you’re using whole herbs (like cinnamon sticks or cardamom pods), you can throw them right in with the wine and then strain before serving. If you’re using powdered spices, add those to a tea filter bag and/or pour the simmered wine through a coffee filter before serving, to avoid ending up with sludge in the bottom of your glass. Some kitchen and grocery stores sell pre-mixed mulled wine spice blends during the holidays. These will save you the time of pulling it together yourself, but watch the sugar content — they can be quite cloying. Sweeten your mulled wine to taste — the combination of spices and wine tannin can add a bitter edge, so adding a sweetener like honey, brown sugar or even maple syrup will help balance it out. Some people also add orange or lemon slices while the wine is simmering, and many recipes call for a dash (or a glug) of brandy to finish it off. Serve mulled wine hot in your favourite mug, garnished with a cinnamon stick and a fresh slice of orange or lemon. Leftover mulled wine can be chilled and kept for a few days in the fridge; heat before serving.